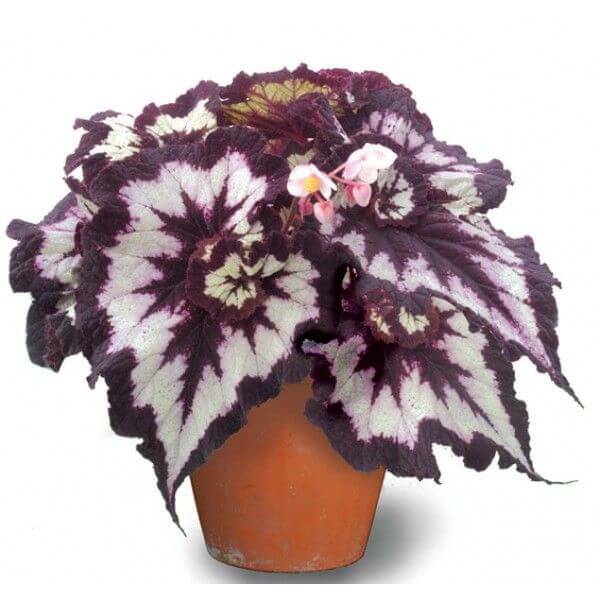 Rex Begonia | Begonia rex hybrids is a colorful perennial flowering indoor plant. It dramatic, large leaves streaked, veined, or splashed in shades of silver, pink, purple, cream, green, or burgundy. Rex Begonia produces tiny, insignificant flowers may grow on tall stems. These plants are considered poisonous and should be kept away from pets and children. 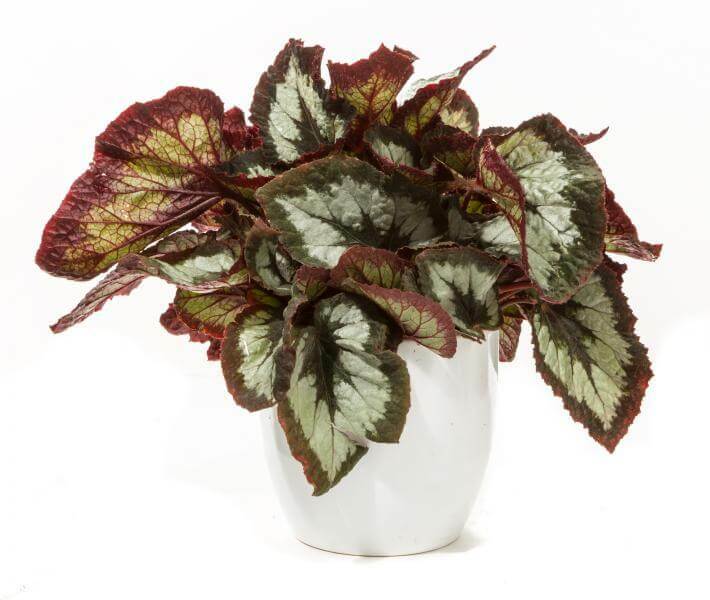 Common Names: Rex Begonia, Painted-Leaf begonia. It grows well in bright indirect sunlight originating from a south, east or west window. It also thrives under fluorescent lights. Avoid direct sun which can scorch the leaves. It requires a well-drained, peat moss based soil, such as African violet potting mix. Water your plant regularly during the growing season and always keep the soil evenly moist but not soggy. You can allow the top 1 inch of soil to dry out between each watering. During the winter months, reduce watering. It prefers an average room temperature of 65 – 75 degrees Fahrenheit / 18 – 24 degrees Celsius. Iron cross begonia is not cold-tolerant and can be harmed by temperatures below 50 degrees Fahrenheit / 13 degrees Celsius. Feed every two weeks spring through fall with a balanced liquid fertilizer diluted by half. Do not feed your plant during the dormant period. Rex Begonia is rhizomatous, growing from a thick, fleshy rhizome that grows just below the surface of the soil. Re-pot in spring when the rhizome outgrows the pot. Because rhizomes have shallow roots, a shallow pot will do. It can be easily propagated by stem cuttings or leaf cuttings. Take three inches to stem cuttings with leaves in early summer and root them in moist, sterile potting blend. Cover with plastic or a glass cloche to raise humidity around it until new leaves form.